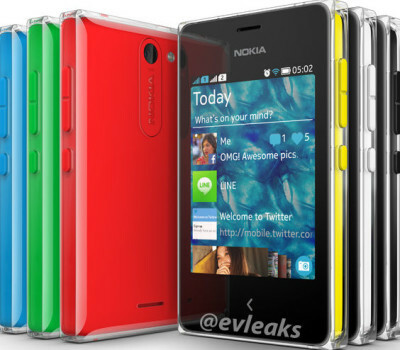 Nokia Asha 502 would be the latest Asha handset from the company. The handset leaked out in a press image, showing new design body in six different colors. It the image is to be believed the handset will come in Red, Green, Blue, Yellow, Black and White colors and Nokia is also working on more variants of 5xx series (500, 502, 503). The handset will have DUAL SIM support. The Asha-502 is the upgraded version of Asha-501. Although there is no word to say yet about the full specifications. The hardware seems to be more tactile and robust. Nokia might include 3G and WiFi feature in the Asha 502. The mobile phone will have Bluetooth, rear camera with LED FLASH. Nokia would launch the handset on October 22 at Nokia world in Abu Dhabai. It is expected that company will unveil six new devices, including new phablet and windows RT tablet.